US leads attack on Syria over chemical attack allegation, just before OPCW inspectors were set to verify whether the attack actually took place. Hours before inspectors from Organisation for the Prohibition of Chemical Weapons (OPCW) were set to arrive for investigation at the site of the alleged chemical attack on April 7 in Douma, United States President Donald Trump, along with allies, has attacked Syria. 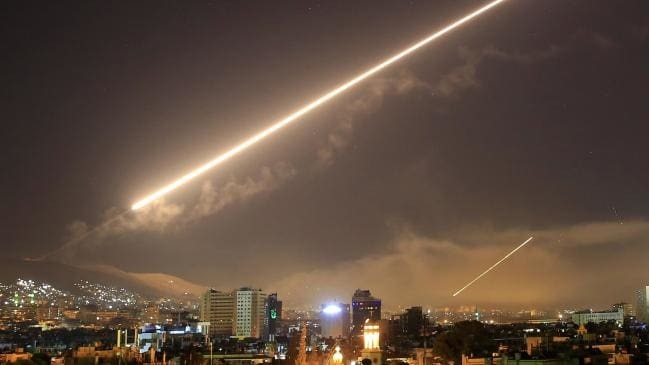 The U.S, U.K and France, without waiting for the inspectors to confirm whether or not the said chemical attack actually took place, have carried out a joint operation in which more than a hundred missiles were launched into Syria early this morning at 4 a.m Syrian time. According to U.S defense officials, at least three U.S warships launched Tomahawk missiles and a British submarine launched cruise missiles from the Mediterranean sea. Long-range missiles were also launched by manned warplanes of U.S, Britain and France, the New York Times reported. None of the Russian bases in the Syria or the areas nearby were targeted. Though U.S Joint Chief of Staff, Gen. Joseph Dunford, has claimed that U.S did not coordinate with or alert the Russian government about the strikes, Florence Parly, the French defense minister, has said that France and its allies had ensured that the “Russians were warned ahead of time,” AP reported. Most of the missiles were successfully intercepted by the Syrian forces using S-125, S-200, Buk, Kvadrat and Osa air defense systems. "According to available information, a total of 103 cruise missiles were fired… The Syrian air defense systems, basically comprising Soviet-made weapons, successfully repelled the strikes by aircraft and naval ships. A total of 71 missiles were intercepted," Colonel-General Sergei Rudskoi, Head of the Russian General Staff’s Main Operations Department, has said. Three civilians have reportedly been injured as “missiles targeting a military installation near Homs were disrupted and exploded”, according to a report. The ostensible reason given for the attack on Syria was the alleged use of chemical weapons by the government forces in the city of Douma. The Syrian government, however, has denied the allegation, and called it a fabrication to lay the groundwork for further foreign aggression against the country. The videos purporting to show that chemical weapons were dropped by the Syrian planes were clearly fabricated, Vassily Nebenzia, Russia's permanent representative to the UN, told the Security Council two days after the alleged attacks. However, hours before OPCW inspectors were scheduled to arrive at the site, attacks were already launched by the U.S, Britain and France, after announcing that the three countries had come to the conclusion on their own that the Syrian government was responsible for the attack. Opposing this attack on Syria, based on unsubstantiated accusations against the Syrian government of using chemical weapons, United National Antiwar Coalition (UNAC) has called for protests that will be held on April 14 and 15 across dozens of cities in the U.S.
Across the Atlantic, campaigners from Stop the War Coalition (STWC) have staged a protest yesterday outside P.M Theresa May’s residence in London, and submitted a letter signed by numerous politicians, academics and trade unionists, urging her to not participate in the U.S-led attack on Syria. “[F]urther military intervention, as proposed by Trump, May, or Macron, is not the solution,” the letter said.